In 2016, Hipposideros hypophyllus slid to the bottom of a list that no species wants to be on – the ‘Critically Endangered’ section of IUCN’s Red List. The assessors stated that only 150 to 200 of these creatures remain, all of them confined to a single cave near the village of Hanumanahalli in Kolar, Karnataka. Today, the bat commonly known as the Kolar Leaf-nosed bat is doing a lot better thanks to the efforts of the zoologists who made the assessment and convinced IUCN to raise the alarm. Bhargavi Srinivasulu is one of them (the other two are Rohit Chakravarty and Chelmala Srinivasulu). Bhargavi works in the zoology department of Hyderabad’s soon-to-be century old Osmania University. Like the rest of the buildings in its sprawling campus, this one too is monumental with high cobwebbed ceilings and wide corridors dimly lit by the sun through decorative windows. One of the corridors led me to Bhargavi. “Since 2003, I have been going to different places to find what kinds of bats are there… are there any new species in the ecosystem? Once we have an idea, we can talk to government officials and come up with action plans for conservation efforts if needed,” said Bhargavi. The re-discovery of the Kolar Leaf-nosed Bat is among her most memorable ventures. This particular bat was first documented in 1974, though it was only later correctly identified. It was said to exist in subterranean (underground) caves, but nothing much else about its population nor about its appearance was studied or known. Bhargavi had a hunch that these bats might be endangered and decided to go looking for them. In 2013, with the help of a grant from the Mohamed bin Zayed Species Conservation Fund, she was able to pursue this search. She started her survey on the bats’ supposed home ground, the former gold mining district of Kolar in Karnataka. Most of her interviews involved asking the people: first, if they have seen bats around the area; second, if there are any cave sites around the area, and third, would they lead her there. 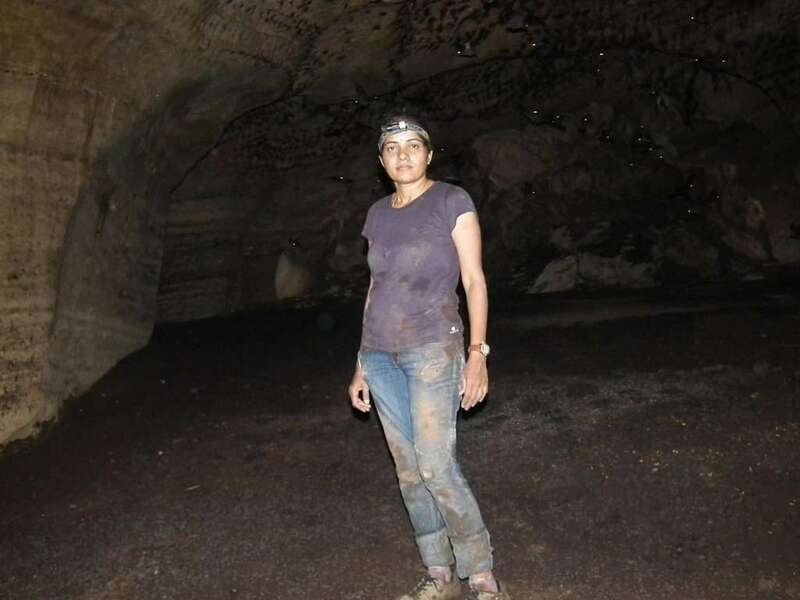 Through this line of questioning, she and her teammates were led to two subterranean caves in the area – one in Hanumanahalli and the other in Therhalli. In Hanumanahalli, Bhargavi saw a huge monolith (made of a single rock) hill ahead of her. She immediately wondered if the hill may have crevices or caves – potential bat homes. At the site, he also noticed suspicious activities afoot. The monolith was dotted with lorries and she soon realised she was witnessing illegal granite extraction. The workers were chipping away at the granite that the hill was made of and loading it onto trucks. That’s when they came across another old man who claimed to have also helped the 1974 team. He said he had gone inside a cave and collected bats and pellets for them. But where was the cave? He pointed down the hill to a tree. They followed his directions and there, nestled between two sheets of granite was what they had been waiting for – a seemingly active roosting site. “We could smell heavy bat guano (poop). 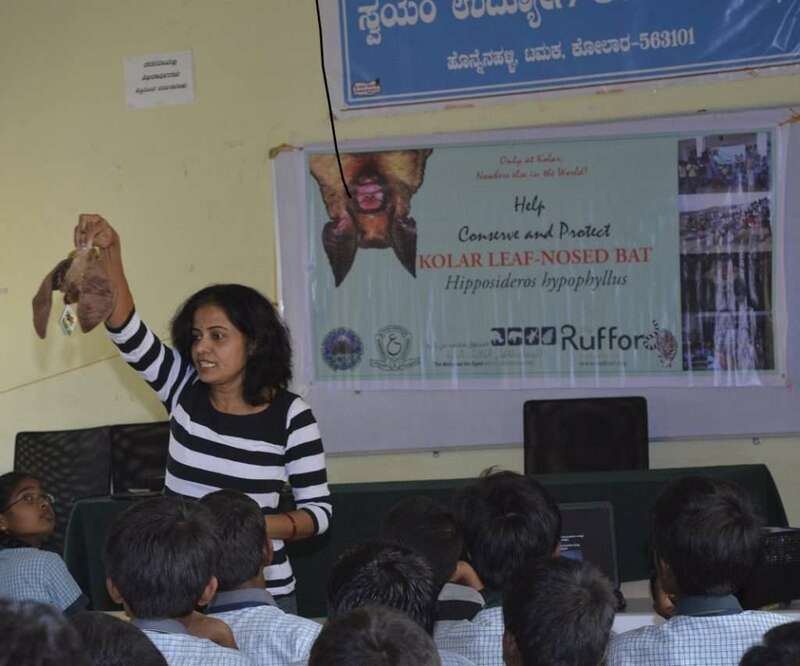 We waited until night, put up a couple of mist nets (a nylon net suspended between two poles used to trap bats), and captured some of these bats.” Bhargavi and her team became the first ones to ever photograph the Kolar Leaf-nosed Bat. The excitement was dampened when Bhargavi realised the severity of the threat faced by the bats due to the mining. The scientists’ guesstimated that the Kolar Leaf-nosed Bats occupy less than 10 km² and only 150-200 individuals remain. According to Bhargavi, due to her team’s efforts, the villagers have now become “custodians of the land”. Moreover, the collector alerted the Mines and Geology Department in Kolar prompting them to issue a ban on mining activity in that area. There have also been discussions about declaring it as a protected area so that in the future, collection for scientific purposes also does not happen. “We have collected around four bats to study them and confirm the species type. Even if people like us keep going there, we could lose the species,” cautioned Bhargavi. Bats drink nectar from night-blooming flowers and while they do, pollen gets dusted off on their fur. They transport his pollen to other plants and in this way, they help in pollinating many fruit and vegetable plants. Bats are attracted to the smell of ripe fruit and selectively eat only ripe fruits from orchards. They swallow the whole fruit and, while doing so, separate the pulp and spit out the seeds on the ground in the forest. This helps regenerate the forests. Spitting out seeds leads to faster regeneration of forests than excreting out seeds – in the case of the latter, out of 100 seeds, only 10 or so might come up as plants since they’ve been subjected to digestive juices. With the extent of deforestation we are doing, conservation of bats will help balance this. Insectivorous bats are really small. They leave their roosts at around 6.30 in the evening and while foraging feed on insect mass about 25% of their body weight. Each one consumes 3000 to 4000 mosquitoes per night! So in a roost of ten bats, imagine how many mosquitoes are eliminated from that particular area. Growing up in Hyderabad, Bhargavi did not dream of becoming a chiropterologist. She loved biology, but caught up in the hype of her time, she only thought of that as a route into medicine. When she didn’t make the cut, she went ahead and pursued a BSc in the subject she enjoyed the most. In college, she met Chelmala Srinivasulu who she eventually married after her MSc. “I did not have any plans of studying further because I come from a very conservative background and MSc was it for me – what comes after that I didn’t think,” said Bhargavi. But her husband had some ideas for her. “He said ‘I’m going to do my PhD – you also have to do it’. He started his PhD in ‘96 and slowly I also began to get interested. I registered for mine under the same guide. When I was reading, he was doing fieldwork. He used to catch bats and come back and describe them to me. That’s when my interest in bats started.” Since her husband was working on fruit bats, she decided to pursue insectivorous ones. The two started their research on the only flying mammal at a time there were barely any taxonomy studies coming from India. Now bats have to fly 15-20 km to find fruits. That is putting too much strain on them because of which they are not giving birth, or not able to feed the pups… this population is drastically decreasing. This is G.Rajasekaran from Tamilnadu. I am a journalist and i am currently looking for expert information about Indian bats. Please help. I leave my email below. LIfe as a woman field scientist, or as a woman anything, is challenging in India. Sometimes I wonder how I have survived physically unscathed (emotional scars remain). But thanks to women like the ones you profile, barriers and stereotypes are being broken. Thanks for letting the world know about their work.